When children are facing developmental, learning, and behavioral challenges early in life and do not receive the essential treatment and guidance they need to set the right course for their development, the outcomes can be heartbreaking. The U.S. Center for Disease Control estimates that up to 1 in 5 children currently are in need of developmental or educational treatment or therapy. Even when children have been diagnosed with a treatable developmental, learning or behavioral delay, many insurance companies do not offer adequate coverage to ensure families and their children can receive the proper or full services they so desperately need. Often, even when families have insurance coverage for the needed services, the out-of-pocket deductible funds associated with their plan can still place treatment out of financial reach. 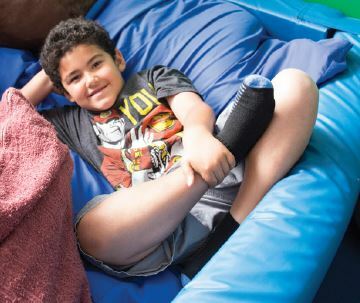 The Child Success Foundation steps in to help fill the financial and make a life-altering difference for these families by providing grants that provide 50% of twice weekly therapy for up to 1 year. We are only able to do this through the generous assistance of individuals and businesses who are committed to the success of the children in our community. Please join us today in our efforts to help every child get their best start in life. Your donation is tax deductible and will help to create a lasting impact on a child within our local Los Angeles community.